Groups of 16+ guests are considered non-refundable booking and the full amount of the booking will be charged at any moment prior to arrival date. During check-in, we will ask a 10 euros cash deposit for each keycard provided, please make sure you have change. 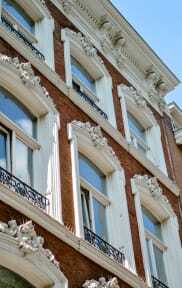 Groups must respect all the general rules stated in the terms and conditions of the Hostel. However, groups have special house rules to make sure that they do not disturb solo travelers and other smaller groups. • Groups are not allowed to use the guest fridge for drinks. We can provide fridge space upon request and is limited to availability. • Groups are not allowed to consume excessive amounts of alcohol. • The Hostel may at any moment restrict/collect any drug substance that is being used in the Hostel area. • In case of disturbance, the employees of the Hostel entails the right to cancel the group stay. Being right in front of Rotterdam Central Station, you can’t have a better base while exploring Rotterdam as Sparks Hostel! Let us welcome you to this beautiful city right after you walk out of Central Station, whether you are visiting as a tourist, for work or as a soon to be ‘Rotterdammer’ yourself! We will do our best to make you feel at home and make your stay as comfortable as possible. Think of a cool lobby relax, read a book, work behind your laptop or have a local beer with some fellow travelers. Excellent coffee to get ready in the morning. Big living kitchen where you can show of your cooking skills. Comfortable beds, with maximum privacy and safety, even in the bigger dorms. Power outlets everywhere, absolutely everywhere! Fast WiFi wherever you are in the building. 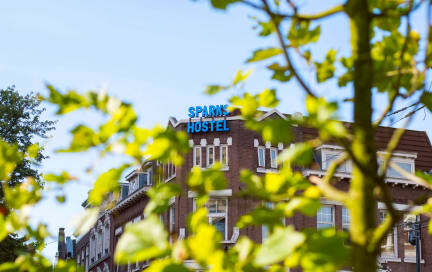 Spark your visit to Rotterdam by staying with us! For those travelers that are on a budget and wants to meet new people, we have our large and spacious 10 persons dorm with custom-made bunk beds. For those travelers that are on a budget, who wants to meet new people or simply do not like to sleep alone, we have dorms with custom-made bunk beds. For the ladies that are traveling on a budget, wants to meet other people or simply do not like to sleep alone; we have our large dorms with custom-made bunk beds. Our 6-bed dorms are not too large, not too little. Just cozy enough to create memories and meet great people. Each room has an en-suite bathroom. Our quad rooms are ideally suited for small groups who prefer privacy and would still like to have the Hostel experience. Enjoy our special extra large custom made bunk beds and your own private balcony. Perfectly located within 2 minutes walk from Rotterdam Central Station the Hostel is situated between the West-Kruiskade and Westersingel. Being right in the center of Rotterdam, the area is famous for its various shops, restaurants, cafes, vibrant entertainment options, fine museums and splendid architecture, all within just a walking distance from the Hostel. Tourist tax is 6.5% and needs to be paid upon arrival.